This is a really great tea called gen-mai cha from Japan. It has brown rice in it (and even some little pieces that look like pop corn) and green tea leaves. It smells more like rice than it tastes. I drink this when I'm hungry because it kind of makes me feel like I'm eating but I'm not. It works .... sometimes. By the way, I'm using an awesome strainer I got at Han Ah Reum. Because there are so many people in our office, we can't possibly celebrate everyone's birthdays. Well, we could but it would be like twice a week we would have to celebrate. So now we celebrate all the birthdays in a given month on the last Monday of the month. To celebrate we have muffins on that Monday morning instead of bagels. I like muffins, but only if they are nice and moist. This is the coffee cake muffin I had this morning which wasn't very moist. I'm not complaining because I think it's really nice that we are recognizing birthdays, but I actually kind of miss the bagels when we have the muffins. Chad's office goes all out for each birthday, but they have fewer people. Heather said today that maybe next time we'll try having donuts instead of muffins. That would be pretty tasty! So the other day I noticed some strange things in the dried plant display in our bathroom. At first I just thought they were some plants I forgot we had, but then I started looking more closely and I realized that the dry cattail in there had exploded! I guess it is trying to spread its seeds all over the world. Isn't that crazy? It's kind of cool looking but also kind of creepy. By the way, we actually went out and did stuff today with Aunt Beth, my mom, and Deb but I forgot to take pictures so I used this one (I've been saving it for a special day). I hate when I forget to take a picture of the thing that was the main thing I did that day, but ... oh well. Hopefully I'll get better at it by the end of the year! So I spent most of the day cleaning because we invited my parents and our neighbors over to have cake and ice cream for Chad's birthday. I hate cleaning, but I love how nice it is when it's clean! We do it so rarely because, well, we choose to spend our time in other ways. This is one of the reasons I hate wrapping presents. When the person has finished opening them, you are left with all this paper that pretty much is going to be thrown away (or recycled if possible). I hope Chad liked his presents! I just finished wrapping these presents for Chad's birthday tomorrow. I hate wrapping presents but I love the way they look when they are done. I think the main reason I hate wrapping them is that I hate #1 wasting paper (you know there are always little scraps that get thrown away) and #2 using the paper. Yes, I hate using the paper. Why? Well, because once I use it, I can't use it again. And I pretty much only buy paper that I really like, so I don't want it to be gone. And you know you can never find the same paper again because most companies that make really nice paper are always changing what they offer. Why is that? It's so aggravating! Especially Ikea. One year they will have great paper and the next year it will be just okay. Just FYI, the black paper as well as the plain brown paper are from Ikea and the green paper is from Target (it is reversible so both types you see are from the same roll - pretty neat!). I'm really excited to give Chad his presents tomorrow. I hope he likes them! I think I like giving presents even more than I like getting them, I just wish I didn't have to pay for them! Haha. This is a photo of our second plant of the month from Adina and Steph. It is jasmine and I was so excited when it arrived because I love the smell! It looks neat too because it is wrapped around a circular structure and is empty in the middle. Right now most of the flowers haven't opened yet and they are just little white tips on the ends of the vines. It's already a great plant! This is the first pomegranate I've ever cut open. I bought it at Han Ah Reum because I wanted to see one cut open up close. They are pretty neat and it is kind of like blood seeping out when you cut it. The juice is delicious! Chad got a vegetarian Indian cookbook from my mom last year and has yet to make anything from it. 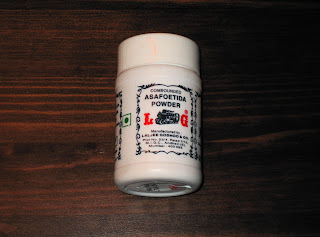 He keeps mentioning a lot of recipes that take something called Asfetida. We looked up information on Indian grocery stores and apparently there is one on my way home from work. So I stopped today to see if I could find the store. Sure enough it was right where we thought it was. I went in and asked if they had Asfetida but the guy had no idea what I was talking about. He showed me to the spice aisle (I thought it was a spice). I couldn't find it there so then I tried the next aisle, and sure enough there it was. I was so excited. I bought it and brought it home for Chad so that now he has no excuse for not making me some tasty Indian food! The store was pretty cool. They had a lot of great spices and dal and such. I didn't get a chance to look that much but hopefully Chad and I will go back there soon. It is less than 15 minutes from our house. How convenient! Now if only we could find some good Indian restaurants around here for lunch/dinner buffet! We miss Delaware Indian food! I made another recipe from Bon Appetit magazine tonight. This is my second one in two months, so I guess I'm track with another one of my resolutions! (The last one - which was to keep up on school work, including reading, has been lagging, but I seem to be doing fine anyway.) The recipe was for cauliflower salad with endive, white beans and a lemon-rosemary dressing. It was pretty darn tasty! Chad helped me with the lemons. I also made some tilapia to go with it. I put enoki mushrooms on it. I love those. We spent almost the entire day at Mitsuwa today (plus all the driving to get there, getting lost, and driving to get home). It's a great marketplace full of Japanese stores and it is kind of like being back in Japan again, except they speak more English. 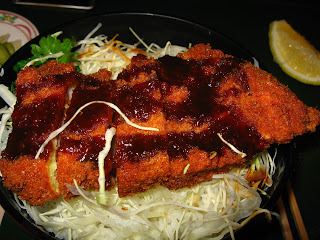 Here is a photo of my lunch - tonkatsu (pork cutlet). It was so tasty! We ate so much today, it was insane. Chad says it wasn't that much but it really was. Between the pastries, cake, ramen, tonkatsu, coffee, and CREAMYAKI (40 minutes) it really was a ton of food. And now I'm paying for it. It was a lot of fun and I'm glad we went. Marissa also joined us, which was fantastic! So I think that the first flowers we got from Adina and Steph have reached the end of their days. What do you think? They were beautiful while they lasted and you know what's great? We can plant the bulbs and hopefully they will come up again next year! It's like that plant that keeps on giving. That's why I like perennials in the garden rather than annuals. I can't wait to see our bleeding heart come back this spring (I hope it does!). Here is another photo of ice. Well, it is kind of hard to see but on my way in to work, I saw the sun reflecting off all the ice on these tree branches and it was just so beautiful. This is the road right outside our office building (Century Parkway). Just think, if Heather and I had been given the window office instead of the one that leaks (it leaked today - yippee) we would be able to gaze out on this loveliness whenever we want. I wonder if we would be as productive ... hmmmm. I love the way everything looks after an ice storm (or freezing rain/sleet which is what we got for most of last night and today). This is a picture looking up at the Golder Associates sign on our office building. It's kind of hard to tell in the small version, but if you click through to the original size, you'll see all the ice on the letters. There was also ice all over the plants and trees but I didn't want to venture too far from the building for fear of getting my precious camera wet! The weather forecasters have been talking for a while about a big winter storm that was headed our way (but that MIGHT pass us by and head out to sea instead). Well today was the day that it was to strike and they were estimating 1 to 3 inches. Yes, I said inches. Not feet, but inches. That is NOT a big winter storm, folks!! Well, anyway, it was snowing a bit this morning when I got to work and I noticed that Mike Borda had his windshield wipers turned out as shown in this photo. Now, I have only ever seen two other people do this in my life and those were my neighbors, Deb and Bud. I don't think we ever did this in my family when I was growing up, but I suppose I easily could have overlooked this. The strange thing is that Deb and Bud have a lot in common with Mike B because they are all kind of trendy and have a lot of style. So is there some special handbook that these stylish people have that tells them to put their windshield wipers out away from the car when it is going to snow? If so, I need to find myself a copy of the book so that I'll know all the cool things too! So I've been dealing with this lab called Quest Diagnostics (I have a feeling like Steph used to work at one of these ...) because of all this stuff my urologist wants to do with respect to the kidney stone I had back in October. He's trying to find out what may have caused it. Well, anyway, it's been something of a nightmare because I went in and they told me they didn't have enough information so I had to call the doctor and the person there was rude to me, and then I had to go back to Quest and then they told me they didn't have enough of my urine to do all the tests, so then I tried to go back and they were closed, and then my mom went to get the containers for me and they gave her a hard time, and then I went back after filling the containers and they told me they couldn't take the samples because I didn't have my paperwork, but I didn't have any paperwork because I had already given it to them but they wouldn't take them and then FINALLY I went back there tonight and the nice lady was there and she had all my paperwork. But guess what? Apparently they didn't take enough blood the first time so while I thought I was just dropping off some containers of pee, I actually had to get blood drawn too (which I HATE). What a nightmare it has been. I just hope they don't call me back there again. If they do, I'm not going. I just don't care anymore. So by now you've seen both Adina and Chad post photos relating to that wonderful Japanese treat known as Melty Blend. (It used to be called Melty Kiss when I lived in Japan, who knows why they changed it ...) Well now it is my turn! 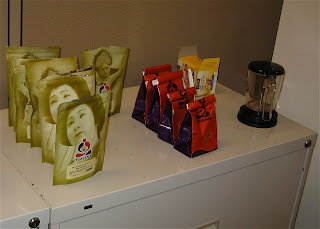 We went to Han Ah Reum last weekend and they didn't have any Melty Blend left and we were sad. We went again today and I thought "Well why don't I see if they happened to put more out" and sure enough, there were about 6 or 7 boxes of the pure chocolate kind and a bunch of the "strawberry" and "milk" flavors as well. I grabbed two more boxes of the chocolate kind. I love Melty Blend. It is a little square of what they call "nama chocoleto" which is kind of like the chocolate you would find in a truffle (very rich and kind of soft). It has a dusting of cocoa powder on the outside. Of course each one is individually wrapped so it is kind of wasteful, but it helps them stay good longer. I'm so excited that Han Ah Reum carried them this year! Hopefully this is the start of a new trend. I'm starting to realize why I get along with Adina so well - we both really love pizza!! (See her post for today by clicking here.) Tonight we went to my office-mate, Heather's apartment for a pizza/games party. We made individual pizzas and played a few pretty fun games. It was a good group so we had a lot of fun. We only used about half the dough she bought, so later in the evening we went into the kitchen to discover that the yeast had gone to work and the dough had about tripled in size. You can see it pictured here. I love dough and I love pizza. It looks so appetizing, don't you think? The little hole is where I poked it. There was a slightly firm crust on the outside and a nice soft doughy center. I had a midterm tonight in my Risk Assessment class. Our teacher told us that when we finished we should go to "the CAD Lab". He told us that it was across the walkway and down on the first floor. I went looking for it but couldn't find it and I asked some other students but none of them knew about a CAD lab except in a different building. I went looking for one in that place but it looked like there was a class in it. I was so confused and just was wandering. Finally I went back to the classroom and waited for other students to finish the exam (I was the second to finish so I had a while to wait). Each person that came out didn't know where the CAD lab was so we just ended up forming a big group. I had to wait about 50 minutes until everyone was finished and then the professor walked us over. It turns out there are TWO walkways and I chose the wrong one and ended up in the wrong building. What a waste of time! I ended up not leaving until 9 instead of the usual 8:30 so I got home a bit later. Now I'm exhausted! 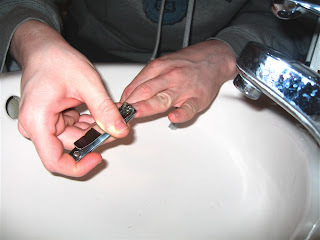 So here is a photo of Chad clipping his finger nails over the bathroom sink. Personally, I never clip my nails because I can't stand the way it feels after I'm done. I don't know how to explain it, but it just makes my fingertips feel so weird. I know it probably sounds insane, but instead of clipping with nail clippers, I just sort of pick at them whenever they get too long. I know, I'm sure that sounds disgusting, but at least I don't bite them. That's good right?? I really love pita bread. I tried making it once but it didn't work so well. One thing I love most about pita is that it is one of the best edible utensils for eating hummus. I made some hummus on Sunday (sort of - no tahini) and got pita to eat with it. My mom often talks about how she likes certain things simply because she can put something else on them. This is one of my favorites. Chad loves waffles. He always talks about them. So one day before Christmas, I was at Walgreens and saw this inexpensive waffle maker, so I got it and gave it to Chad for Christmas. He used it for the first time to make waffles for us this morning. They were pretty good, although maybe we need to try out some other recipes. If you have a really tasty waffle recipe, please feel free to send it along to us! This is a picture of the first one he made. The directions said to put 1/3 of a cup of batter in the middle of the plates. So Chad put one third cup in the center between the two waffle areas. Well, the directions must have meant to put 1/3 of a cup in EACH of the two waffle plates because the first one only spread out halfway into each side. But it looked pretty darn cute anyway! A co-worker told me about a cafe in Philly called the Naked Chocolate Cafe. I had passed it once before while walking around and thought it looked pretty cool. We went there today with my family and tried out their chocolate drinks. 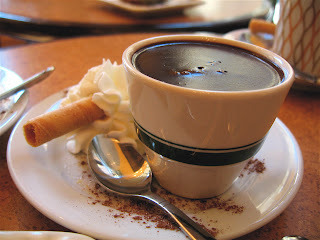 You are looking at a small espresso cup filled with basically melted bittersweet chocolate. It was very very rich and thick and tasty of course. You almost needed to drink milk or water along with it because it was like eating a really chocolatey dessert! Anyone who is all about chocolate should go check it out! Don't ask me why the liquid in this Diet Coke bottle is white ... I'm assuming it is milk or something. I just couldn't resist grabbing a shot of this when I saw it in one of our office refrigerators. When I first saw it, it was full all the way to the top, which looked even stranger because it could have been un-opened. Personally, I'm all about re-using containers, but I don't think I would ever put milk in a previously used Coke bottle. I remember when I was younger I used to enjoy mixing different drinks together. My favorite concoction was Coke and orange juice (but not Pepsi, it was too sweet). One time I had the crazy idea that it might be good to mix Coke and milk together. Well of course my mom didn't want to let me do that and she said that if I did, I would have to drink the whole thing. Well, I hated being proven wrong so I went ahead and mixed the two together and it was absolutely disgusting. I don't remember if she actually made me drink the whole thing ... I want to say that she did, but in all honesty, she really was never really that mean ... maybe she remembers. Anyway, perhaps that is the reason I was so disturbed by this white liquid in a Coke bottle. Chad got some Chinese food for us to share tonight for dinner. He got us some steamed dumplings and there was this little plastic container of dipping sauce stuck in with them. Because they had steamed up, there were little droplets of condensation all over the container and I thought it looked pretty cool so I took a photo. Is it sad that I find things like this interesting? I guess it's good to find mundane things interesting. If I didn't, my life would be so much more boring than it already is! !